I had the honor of participating in a ceremony yesterday that required me to break out the old tuxedo. The ceremony went well and I had a great time, but the real fun started when I returned home to the CowChows. As I came up the stairs from the garage I found the lovely Lady BG, barefoot in the kitchen and slowly scrubbing a spatula with hot soapy water. "Hi handsome," she said in a sultry tone. And then, letting the spatula drop into the water she began drying her hands on her apron and asked, "How would you like to make yourself useful?" My mind began to whir at the possibilities and I made a quick mental note to wear my tuxedo more often. As I reached for the bow tie at my throat I said, "And, just what did you have in mind, Miss Moneypenny?" She pointed to the kitchen table behind me and said softly, "Would you take that watermelon rind out to the compost pile? It's starting to draw gnats." 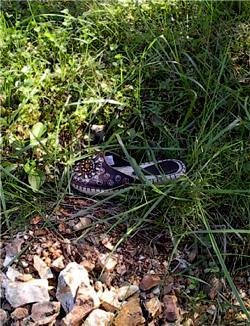 And so I did, but on my way back from being useful I came upon a surprise: a girl's slipper laying in the grass. I knew immediately that it did not belong to the Lady BG, and almost as quickly I knew who it must belong to. I didn't know why the little blond haired girl from next door was wandering about our yard, or how she could've come to lose her shoe, but I figured as long as I was being useful I might as well return it. I rang the bell and after a moment the door swung open. The little blond haired girl did a double take at the sight of me standing on her front porch in a tuxedo and holding her shoe. Before she could say anything, and I don't know why, I dropped to one knee. And, holding the shoe out in front of me I said, "Pardon the intrusion, Milady, but my princess has stolen my heart and vanished into the night. I have only this slipper to prove her identity. Would you do me the honor of trying it on?" I reverently placed the slipper on the ground in front of her. She giggled and blushed and deftly slipped her foot into the shoe. I stood, bowed at the waist, and said, "It is you! My princess." She shook her head, rolled her eyes and said, "You're so silly," and closed the door. I could still hear her giggling as I walked away. Happiness in life is about balance. Don't forget to indulge your silly side. Saturday, October 9, 2010, from 8:00 AM to approximately 10:30 AM: Most Worshipful Brother Gail S. Turner, Grand Master of the Grand Lodge A.F.& A.M. of the State of Missouri will hold an area meeting following breakfast at Gate of the Temple Lodge No. 422, located at 1700 N Boonville in Springfield, MO. Breakfast will be ready at 8:00 and the area meeting is scheduled to begin at 9:00 AM. All area Missouri Freemasons are encouraged to attend; friends and family are welcome to attend, as well. Saturday, October 9, 2010, from 4:00 PM to approximately 5:30 PM: Most Worshipful Brother Gail S. Turner, Grand Master of the Grand Lodge A.F.& A.M. of the State of Missouri will hold an area meeting prior to the dinner and ceremony of Installation of Officers of Branson Lodge No. 587. Branson Lodge is located at 100 Chief's Circle in Branson, MO. All area Missouri Freemasons are encouraged to attend; friends, family and guests are welcome to attend, as well. Sponsored by the Valley of Joplin KCCH, this will be a four person scramble tournament, and is open to all Master Masons and Guests. There will be three flight prizes, gentlemen and ladies long drive holes, gift packs, mulligans, and prize drawings. Entry is just $75 per person. The tournament will be held at the Eagle Creek Golf Club / Downstream Casino Resort in Joplin, MO. Hole Sponsorships are available to your business, organization, or as a personal or memorial donation for only $100. All net proceeds of the tournament and 100% of the Hole Sponsorship donations benefit the Joplin Scottish Rite Care Clinic to assist children in southwest Missouri with hearing and speech deficiencies.